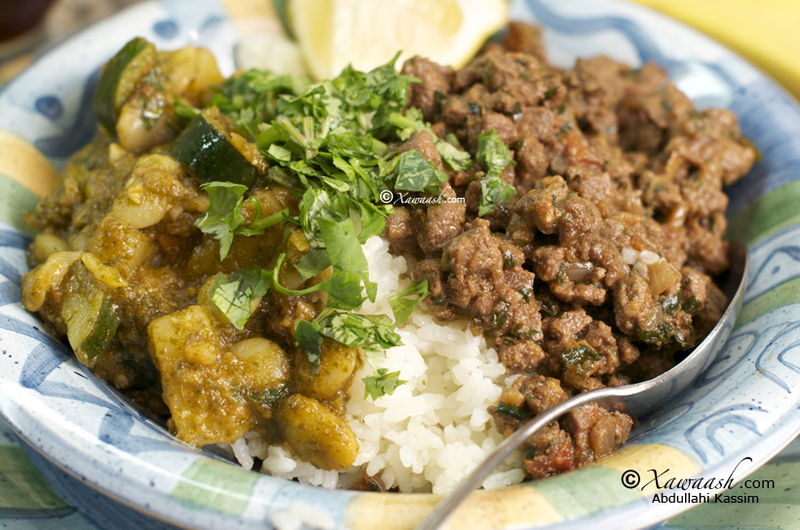 Somalis have very few vegetarian dishes. In the southern part of Somalia, where most of the agriculture is concentrated, more vegetables are consumed. 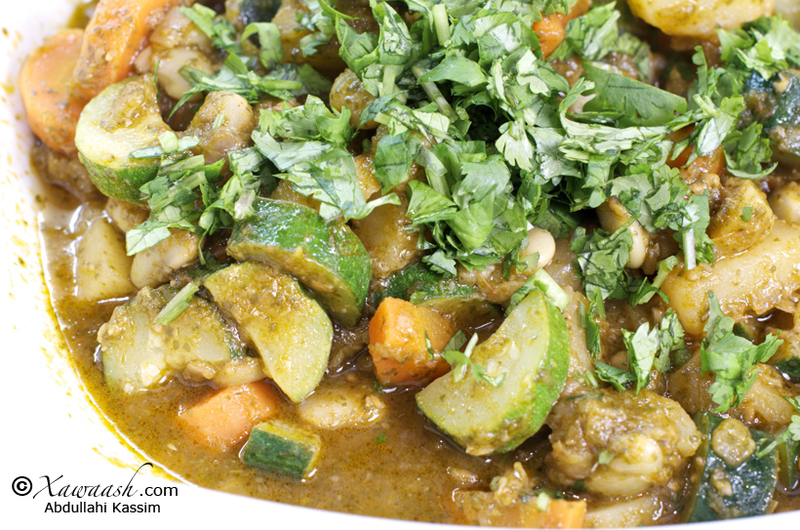 For most Somalis, vegetables are added to meat dishes. Potatoes, carrots, green peppers, pumpkins, and plantains are popular. The following is a vegan recipe that is both nutritious and flavourful. 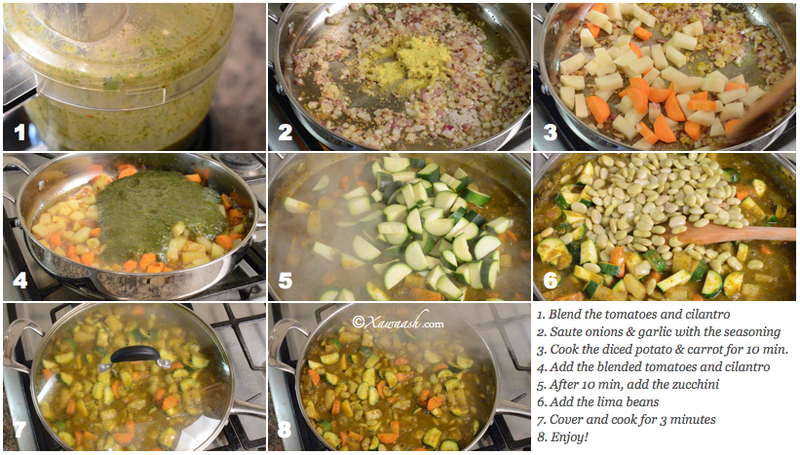 The vegetables are added at different stages depending on the cooking time required for each of them. For instance, the potatoes and carrots take the longest time, while the zucchini is best when it is cooked for a just a few minutes. Zucchini can be eaten raw and is great with salads. The canned lima beans are already soft and need very little time to mingle with the other ingredients. If you plan ahead, you could use dried lima beans. Just soak them overnight and add them to the pan in the initial stages together with the potatoes and carrots. That way you wouldn’t need to use the canned beans. Les Somalis ont très peu de plats végétariens. Dans le Sud de la Somalie, là où la plupart de l’agriculture est concentrée, les légumes sont plus consommés. Pour la plupart des Somalis, les légumes viennent en garniture des plats de viandes. Pommes de terre, carottes, poivrons verts, citrouilles, et bananes plantain sont populaires. pour chacun. Par exemple, les pommes de terre et les carottes prennent le plus de temps, alors que la courgette est meilleure lorsqu’elle est cuite juste quelques minutes. La courgette peut être mangée crue et elle va bien dans les salades. Les haricots lima en conserve sont déjà cuits et ont besoin de très peu de temps pour s’accommoder avec les autres ingrédients. Si vous préparez à l’avance, vous pouvez utiliser des haricots lima secs. Il suffit de les faire tremper une nuit et de les ajouter à la poêle au tout début avec les pommes de terre et les carottes. Comme ça, vous n’aurez pas besoin d’utiliser des haricots en conserve. Cut the tomatoes into big pieces and roughly chop the cilantro then blend in a food processor or blender. Saute the onions and garlic then add the vegetables seasoning. Cook for 2 minutes then add the diced potato and carrot and cook until lightly brown. Add 1 cup of hot water and cover and cook for 10 minutes. Stir in the blended tomatoes and cilantro and cover and cook for another 10 minutes. Add the chopped zucchini, the lima beans, and ½ cup of hot water. Cover and cook for 3 minutes. Couper les tomates en gros morceaux et hacher grossièrement le coriandre puis mixer dans un robot ou un blender. Faire sauter les oignons et l’ail puis ajouter l’assaisonnement pour légumes. Cuire 2 minutes puis ajouter la pomme de terre et la carotte coupées en dés et cuire jusqu’à ce qu’ils soient légèrement colorés. Ajouter une mesure d’eau chaude et couvrir et cuire pendant 10 minutes. Verser les tomates et le coriandre mixés et tourner puis couvrir et cuire 10 minutes de plus. Ajouter la courgette hachée, les haricots Lima, et ½ mesure d’eau chaude. Couvrir et cuire 3 minutes. 1. Yaanyada iyo kabsarada isku shiid. 2. Basasha iyo tuunta saliidda ku-dallac. Maraq qudaarta ku-dar. 3. Bataatada iyo karootada ku-dar oo 10 daqiiqo kari. 4. Yaanyadii iyo kabsarada aad isku shiidday ku-dar. Toban daqiiqo kari. 5. Zukiinida ku-dar. 6. Isla markaa, digirta ku-dar. 7. Dabool oo 3 daqiiqo kari. 8. Waa diyaar! 1. Mixer les tomates et le coriandre. 2. Faire sauter les oignons et l’ail avec l’assaisonnement. 3. Cuire la pomme de terre et la carotte 10 minutes. 4. Ajouter les tomates et le coriandre mixés. 5. Après 10 min, ajouter la courgette. 6. Ajouter les haricots lima. 7. Couvrir et cuire pendant 3 minutes. 8. Bon appétit. Thank you so much for your wonderful comment and thanks for spending the time going through the recipes. This sounds wonderful, and so very healthy! This is delicious and healthy, thank you for sharing. I always come and see what is new. Thanks for visiting regularly. We will keep updating with new recipes. Jazaakumullahu khayran,waxaan jeclaan lahaa inaa nabartaan soor fur-fur iyo malaayga lagu yaqaanay baraawo sida loosameeyo. 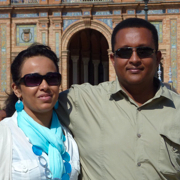 Assalaamu Caleykum Sheikh Abdulqaadir. Hadduu Eebbe idmo mar dhow ayaan soo gelin doonnaa laakin waxaan sugeynaa inaad keentid soorta galleeyda cad. Dukaanka waan ka weyney! Thank you Yasmeen. Please share the information with those around you. this looks so good and health. i will definitely try this as i love vegetables and trying to stay healthy for me and my family. Thanks alot for sharing your recipes with us. jazakhulahul qeyr. may allah reward you and your family. Thank you for your prayers. They mean a lot to us. hello,i cooked the khudaar for my family today and they loved it. Thanks alot. Just wanted to ask on the recipe the xawaash is missing. 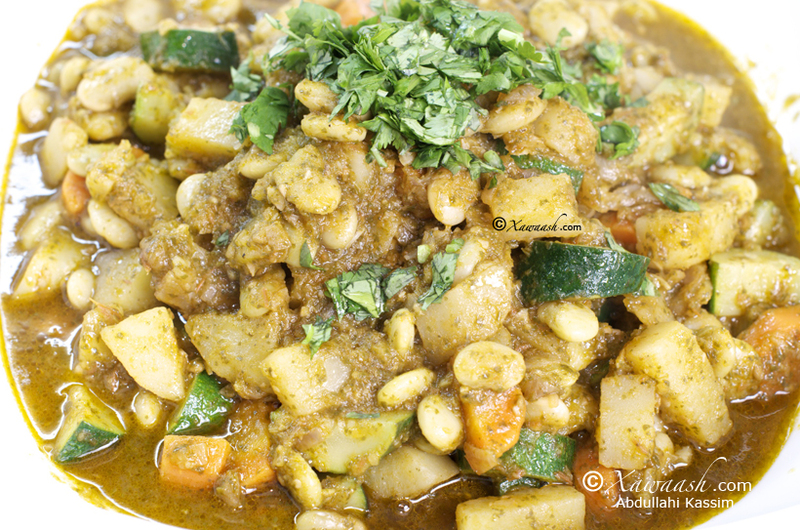 This is one of those recipes that we didn’t include xawaash in the ingredients. If you wish you can add it and it will work well. We are happy you liked the recipe. I have visited alot of websites and food blogs but what keeps me interested alot is how your recipes are simple and straight forward. i love the way you tell the stories through food.Thanks again for sharing your wonderful stories and recipes. Thank you very much for the comment. Our intention for this website is for it to be more than just the food. We would also like it to be about the culture surrounding the food. Walaal salaan qaali ah ka bacdi,waxaanku weydiin lahaa koobka biyaha ah e lagu daraayo intee le’eg yahay ma kan shahaa ma kano cabitaankaa koobabaka waa kalo weyn yihiin ee wxn jeclaan lahaa in aad biyaha ml iigu soo sheegtid kobkii qiyaas ahaan. Waan cusboonaysiinnay soo’da qudaarta. Su’aalahaada jawaabtooda hadda waad ka-helaysaa. Mahadsanid. Salaan iyo duco ka bacdi walaalha waxaa iga qaldan biyaha inta ay leg yihiin qudaarta lagu daraayo ml ayaa ii yare rooon ama koob aan isla naqaan waayo koobabka waa badan yihiin, waxaan kaloo idin weydiin qadooyinka aad wax ku cabirtaan halkee ka soo gataa iyo inta xabo ay ka kooban yihiin, jzk allaah abaalkiina jano haka dhigo cunada aad na barteena kuwo ale ugu cibaadeysta allaah hanaga yeelo idinkana misaanka akhiro idiin cuslaysa. Waa ku-mahadsan tahay salaanta iyo ducada. Qaaddooyinka aan isticmaalno waa afar qaaddo isku xiran, 1 QW, 1 qy, 1/2 qy, 1/4 qy. Waxaad ka-helaysaa dukaamada maacuunta lagu gado. Mahadsanid. Walaalha jzk wax walba waan fahmay. My potatoes turn out hard if I do not boil it first even when I am cooking suugo or suqaar. Can I just pop my potatoes in like you did in this dish here or will It turn out hard or should I just boil it. I’m always worried about my potatoes turning out hard and do not know what to do. If you dice the potatoes and cook the way we did you should have no problem. You do not need to boil the potatoes for this recipe. You can boil potatoes if you are using them for tomato sauce, as it takes longer to cook. Waan ku-faraxnay inaad jecleysateen qudaarta andiga iyo reerkaada. digirta nooca waaweyn waad isticmaali kartaa. Zucchini-gana ka-yareey, hal ayaad isticmaali kartaa ama hal iyo bar. Maraqa markaad karinaysid waxa aad jeceshahay waad ku-dari kartaa, ma’ahan sida waxyaabaha la-dubo oo kale (doolsho, buskud, rooti, iwm). Waxyaabaha la-dubo (baking) waxay u-baahan yihiin cabbirro 100% sax ah. We are happy that you like the vegan category on our site. We hope to post more vegan recipes. Thank you. We are happy that you have joined Xawaash.com. Thank you very much for your comment. Some vegetable seasoning give you better results than others. We use Family brand seasoning salt nowadays. God willing, we will post more vegetarian recipes. Thank you for your reply If vegetable seasoning and vegeta seasoning is just average seasoning from market, how does one get the “Somali” taste in all these dishes? I love it so much. Thank you again!! You can use the Somali spice mix Xawaash. Here is a link on how to make it http://xawaash.com/?p=12.